This article is part of a series derived from our most recent Algo Boot Camp, in which we developed a strategy for harvesting risk premia. We have allocated proprietary capital to the strategy, and many of our members are trading it too. 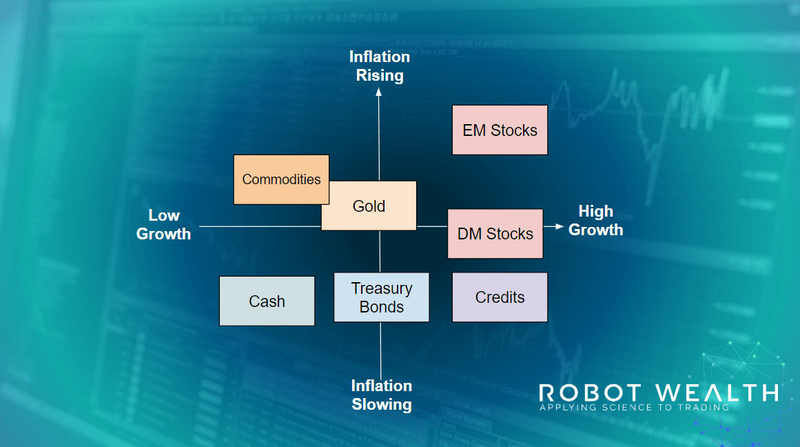 In our Boot Camps we develop trading strategies in collaboration with the Robot Wealth community over an 8 week period. The Boot Camp format is proving incredibly useful for teaching our members how to research, develop, think about the markets and execute real trading strategies. They get to watch us do it every step of the way, and watch every decision we make. In our next Boot Camp, we’ll be developing a portfolio of active FX strategies. Find out more about Robot Wealth’s Algo Boot Camps, including how you can be a part of the next one, here. Investing: the easiest game in town? 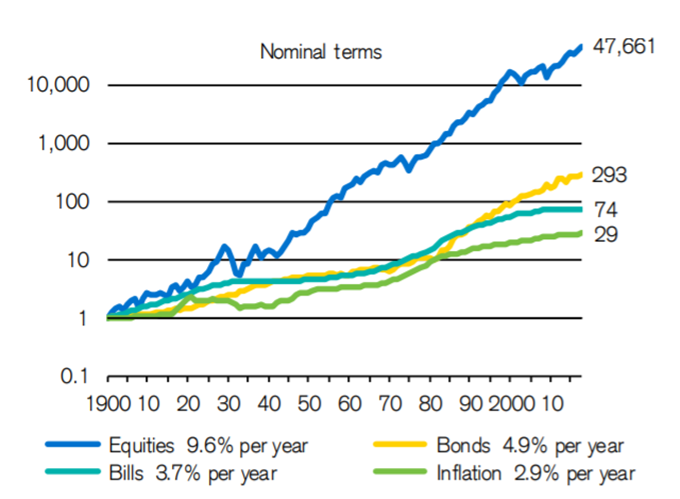 The blue line shows returns from US Stocks from 1900 to today. That’s a 48,000x increase in nominal value. The yellow line shows returns from US Bonds from 1900 to today. That’s a 300x increase in nominal value. So it’s pretty obvious what we need to do in order to make money in the markets. Assuming I have a fairly long investment horizon, I buy the stocks, I buy the bonds. I go to the beach. But of course…it’s not quite that simple. Unless you’re a robot. If you are human with normal human fears, feelings and lifestyle and income uncertainties, then we can’t discuss the rewards of buying stocks and bonds without discussing the risks. The reason that stocks tend to go up in value over the long run is that they have a tendency to go down in value – sometimes quite considerably – in the short and medium term. Look again at the chart above. Notice the logarithmic y-axis. That’s the best way to look at long term asset prices. But it does tend to misrepresent what the experience of holding US stock exposure over that period would actually have been like. Check out this chart, which takes the blip in the red square, corresponding to the GFC, and plots the S&P 500 in dollar terms. 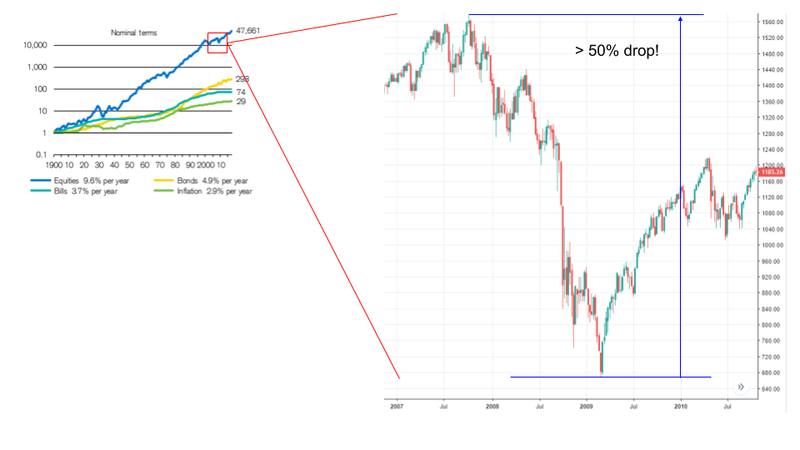 That 50% decline looks benign in the long-term chart, but how would you really feel if your million-dollar stock portfolio was suddenly worth $500k? Obviously, it’s not very much fun to watch half of your asset value crumble in front of your eyes. It bears repeating: the reason stocks go up in the long term, is that they tend to go down (sometimes violently) in the short and medium term. That’s a highly unattractive quality for an investment asset – so holders demand some kind of reward or premium for taking on that risk. Under this paradigm, investing becomes an exercise in risk management. And good risk management requires a decent understanding of the risks being taken, coupled with some intuition around why reward should flow to the investor for taking on a particular risk. If this sounds weird, consider that pretty much any investment you might make is based around you anticipating some reward or payoff, knowing that there’s some level of risk involved. For instance, say you purchase a government bond. In this case, you know with a fairly high level of certainty what the reward will be at maturity. The risks that you bear in making this investment are the chance of the government defaulting, as well as the volatility in the price of the bond between the purchase time and maturity (this is risky in the sense that if you needed to liquidate prior to maturity, volatility exposes you to the risk of making a loss on the sale). If you instead invested in a stock, you may have a much less certain idea of the expected reward. In addition, the risks associated with stock investing are usually greater than buying bonds – just look at the historical volatility of stock indexes compared with bond markets. The different risk-reward profiles of these investments (including their uncertainty) should give pause to the investor to consider their approach. Is one investment superior to the other? Should you put all your eggs in one basket? Is there an optimal allocation into both investments? These questions are really the crux of risk premia investing and no doubt you can see that an understanding of the risks associated with each investment is key to any investment decision. In a practical sense, being long risk premia means buying and holding assets that are exposed to various risk factors. We can think of a particular asset as being composed of various risk factors. For instance a US government bond is mostly going to be exposed to inflation risk. It carries little to no credit risk, since the US Treasury is almost sure to pay you back. A stock, on the other hand, is going to be exposed to all sorts of risk including economic, political, inflation and liquidity risk. Being “long risk premia” is equivalent to being long some combination of risk factors. But what is the optimal combination? Does an optimal combination even exist from a trader’s perspective? We explored these questions throughout the Boot Camp, but we can start the discussion by thinking about the different conditions that generally give rise to premia for taking on different types of risk. When are different risks rewarded? If you think about it, it makes sense that different risks tend to be rewarded under different conditions. For instance, during a market crash or recession, bonds have tended to outperform in the past. That’s another way of saying that taking on inflation risk is rewarded. During an equities bull market, taking on economic risk is rewarded through rising stock prices and dividends. As with all things related to the markets, hindsight is a wonderful thing. Anyone can look back and work out which risks were rewarded in the past. The real trick is predicting which risks will be rewarded in the future. Of course, no one has a crystal ball, so there’s always uncertainty around our forecasts. Often we are more interested in managing this uncertainty than we are in absolute returns. 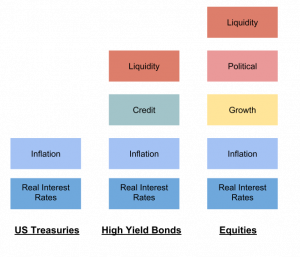 Therefore, the goal often becomes to construct a portfolio of various risk factors in pursuit of a good trade-off between future reward and uncertainty. The investment objective and policy of the Fund are to provide attractive returns with relatively limited risks, with no material bias to perform better or worse in any particular type of economic environment. The portfolio is expected to perform approximately as well in rising or falling inflation periods, or in periods of strong or weak economic growth. Such portfolios will typically have proportionately significant dollar exposure to long and intermediate term government bonds, smaller dollar exposure to equities, and a minor allocation to gold and possibly other commodities. But many variations on this theme exist. The significant exposure to low volatility, positive carrying, fixed income assets tends to give these sorts of portfolios a relatively smooth performance curve, at the expense of the additional upside that’s possible from exposure to equities. This involves moving into and out of various risk exposures based on some signal or forecast. The well-known Dual Momentum strategy is a simple, yet extreme, example of this approach, as it shifts the entire allocation between US equities, international equities and government bonds. Most variants of tactical allocation instead involve re-weighting the portfolio’s allocation to be overweight certain assets at certain times, while still maintaining some allocation to other factors. Many variations on the tactical allocation theme exist, and a significant proportion of the funds management industry is based on this approach. But here’s the thing about tactical allocation: it’s hard. The premise of this approach is that a skilled manager can outperform a permanent allocation using clever timing and selection of factors. But using this approach, it’s all too easy to mis-time active decisions and wind up with something that underperforms a more strategic, low-turnover portfolio. So you can end up spending a lot of time and effort for little, or even negative reward. Throughout the recent Boot Camp, we explored both approaches and developed an algorithm to manage our own long risk premia portfolio which combines both of these approaches. In the next blog articles, we’ll share with you some of the insights that we gained along the way.